An appointment was made for me to see a local chiropractor. This was AFTER trying physical therapy…. AFTER trainers at Kean University weren’t able to help, and AFTER the neurologists didn’t know what else to do! “I was frustrated but mostly I was agitated, because as an athlete (Dr. Glenn was a football player on the Championship 1994 football team) it never took more then a week before I saw my body getting better from an injury, and now this radiating pain going down my legs was threatening to keep me off the field for over a month and a half! There were days when I was in so much pain, that I had to stop and get out of the car 3 times on my way home from practice.” The drive was only 20 minutes. Dr. Glenn began his pre-chiropractic education at Kean University where he studied the basic sciences such as inorganic chemistry, organic chemistry, biology, along with basic physiology and anatomy courses. After completing his study there, he was accepted at Life University of Chiropractic in Marietta, GA. During his four years at Life, courses included biochemistry, a major emphasis on anatomy and human physiology, X-ray, diagnosis, chiropractic adjusting techniques and patient care in the Life University Public Clinic. 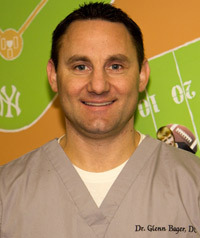 After graduating in 2001 Dr. Glenn returned to the Colonia area to establish his practice. A place where his heart was because it was where he grew up. “We love skeptics,” smiles Dr. Glenn. Dr. Glenn has been happily married to his wife Diane for nearly 5 years. Two of his children have never been vaccinated. (If that sounds interesting, be sure to ask Dr. Glenn to explain!) Both of the children that they had together were difficult and strenuous births.